Comprehensive HIPAA audits done right, the first time. Meet your HIPAA deadlines and close the gaps in your patient data security with a thorough HIPAA assessment from our experienced auditors. A thorough HIPAA security risk analysis is a critical component of HIPAA compliance, whether you are a covered entity or business associate. Our experienced auditors guide you through a comprehensive risk analysis to identify potential security gaps that put your patients' data and organization at risk. By conducting a HIPAA risk analysis you are also completing Meaningful Use requirements. Building on the results of the risk analysis, our auditors create a custom risk management plan that details the actions necessary from covered entities and business associates to close the gaps in your security and compliance efforts. You’ll enjoy a clear point of contact as you work to meet HIPAA requirements, and with a team of audit experts all centrally located in Utah, it never takes long to get an answer to your questions. Helping your business associates with HIPAA compliance and protecting your patient data is a crucial step in your HIPAA compliance and data security plan. We have tools and solutions for business associates to work towards HIPAA compliance and increase their security posture. Feel confident in your HIPAA assessment knowing that we have several years of audit experience as well as a team of qualified Healthcare Information Security and Privacy Practitioners (HCISPP). Our auditors are also security and risk minded, meaning they’re not just focused on checking off HIPAA requirements—They’re serious about creating a more secure data environment at your organization. SecurityMetrics assessors are accurate, experienced, easy to work with, and responsive to your needs. Conducting a Risk Analysis and working through HIPAA requirements are not one-time events. Clients enjoy working with SecurityMetrics assessors so much that over 90% of customers return for security assessments the following year. SecurityMetrics assessors offer a unique blend of compliance, security, and workflow experience to efficiently drive results. Where other assessors act as a bottleneck, our assessors work with you as a team to reduce friction on your path towards HIPAA compliance. Conducting a risk assessment is required as part of HIPAA compliance for covered entities and business associates. SecurityMetrics assessors are able to perform a National Institute of Standards and Technology (NIST) 800-30 Risk Assessment, one of the suggested frame works in the HIPAA standard. 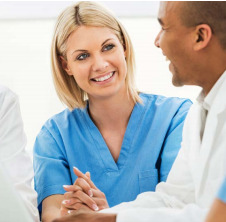 A thorough and accurate HIPAA audit consists of many individual components and activities.  When these individual pieces aren't designed to work together, deadlines are missed and vulnerabilities are overlooked. Our risk analysis process, gap analysis, penetration tests, and other tools are designed to work together to reduce friction on your path towards HIPAA and Meaningful Use compliance. Conducting a HIPAA security risk analysis not only gets you a step closer to HIPAA compliance, but also completes a Meaningful Use objective. Our compliance assessors can also assist in completing attestation of Meaningful Use objectives to ensure deadlines are met and incentive payments are received. By analyzing your unique workflows and data paths, SecurityMetrics assessors help to establish more efficient arrangements for your data environment to improve PHI security and remove costly, unnecessary steps from the process. 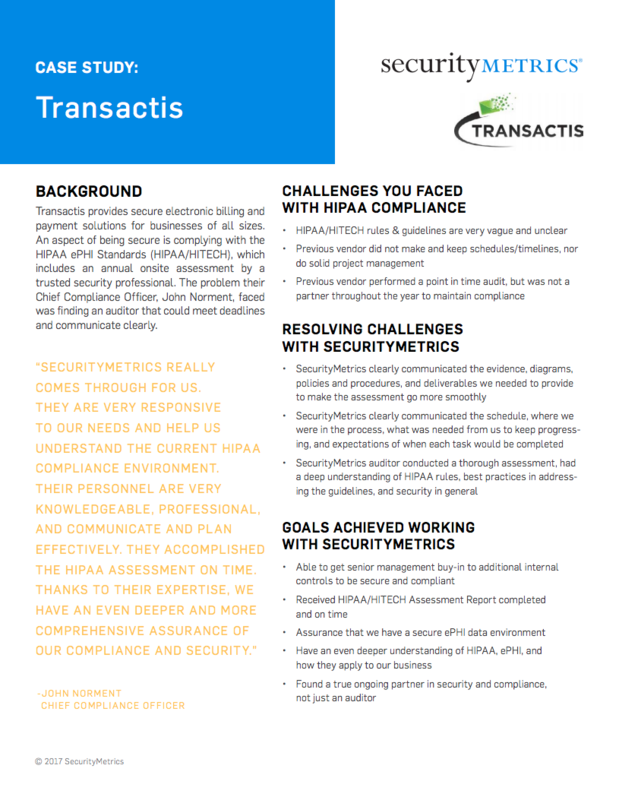 SecurityMetrics HIPAA Assessment pricing is simple—we determine the scope of the work and provide you with a custom price quote for the audit. There are no hidden charges, no add-on fees, and no onsite hourly charges. SecurityMetrics gives you one price that won't change. 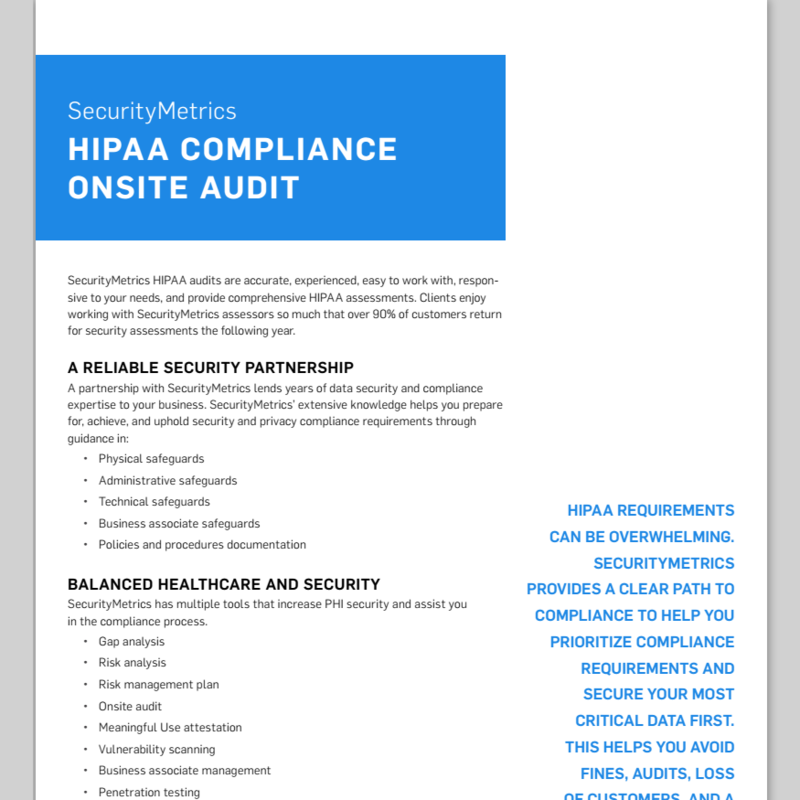 SecurityMetrics gave me the support and help to quickly review my HIPAA compliance.